Been a little while since my last update.. I apologize, but I promise to make up for the lack of info with a sweet little two-part post. I believe I last talked about Hawaii on the blog. This race had much more of an affect on me that I realized. After analyzing that race, came to the conclusion that my cycling was weak sauce. I flat out got beat on the bike and had been concentrating so much on my run that I'd forgotten about cycling. I ran a 1:30 on an extremely tough course where Luke Bell (one of the best iron-distance pros today) ran a 1:23. So when I got home,I basically put my running on the back burner and worked on cycling. 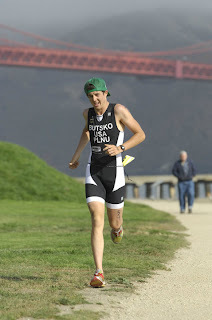 By the time the Vineman 70.3 rolled around in late July, I had gained around 5lbs of muscle in my legs (which doesn't sound like much, but when you take into account I've weighed 148lbs for the last 4-5 years, it's a pretty big thing). My swim and bike were really strong and they had improved a lot, which was evident in racing Vineman. I ended up winning the 20-24 division by just over a mintue, but only after having one of the worst half-marathon runs of my life. I'll never forget going for a run the day before the race and realizing that I hadn't actually ran in over a week. It felt awkward and I actually forgot my form completely. island), hilly and technical bike course (25 miles), and tough/hilly off-road 7 mile run. Aside from the run, I thought I could really put down some time on people in the swim and bike. For the most part, that's how the race unfolded. Race morning, I woke up early, biked to the transition, set up and shuttled over to the docks to board the boat and head out to Alcatraz. 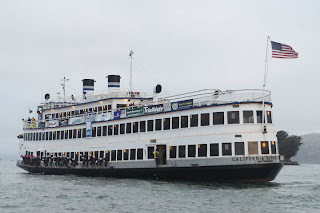 The race started off by jumping off the ferry and swimming to the shore. The problem was.... I had no freaking idea to where we were supposed to be swimming to. There were no markers and they told us on the boat to swim towards the Ghirardelli's sign (which, I knew was nowhere near our target destination). The pros got a 15 second head start on the AGs. So I quickly devised a plan that I could be the first off the boat, dive and catch up to the back of the pack of pros and hang on to that pack and be in ok shape. 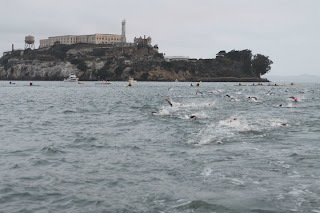 Cause lets face it, you really cant trust swimming in a pack of age groupers, who knows where you'll end up, especially swimming blind in the middle of the SF bay. My plan actually worked and when I jumped off the boat, I sprinted to latch on to the back of the pro group. I swam with this group for probably 10-12 minutes (maybe 800/900 meeters). I didn't even look where we were heading towards, to be honest, I was just concerned with staying on someone's feet. Right around then I felt a side current come out of no-where and split the group up into two. I "pulled a Keith" and stopped swimming for a second to check out my position, do some quick sight seeing, have a chat with God, then decided to start swimming again. After my little 2 second break, noticed that I had fallen off the pack. 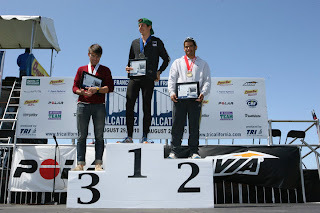 Once you fall off the pro pack, unless your name is Andy Potts or Kosuke, your not catching back up. So the second half of this adventure was a solo effort, trying to figure out where I was actually swimming to. I still managed to have one of the better swims of the day, getting to shore in 30 minutes. The bike course was tough... I really took delight in catching up to the big powerful cyclists on the steep climbs, then getting smoked on the descents and turns and feeling depressed. I had a decent ride but was running out of gas around mile 20, just using all of my matches by powering up all the climbs. Got to the run and felt really good for the 1st 2 miles. In fact, I hit the 2 mile mark in 11:25. Then the hills start. That's where I threw in the towel and decided to go into survival mode. I couldn't run up these hills to save my life. I just hadn't done much running to have any significant speed. Then right as I got into a rhythm, we hit the deep sand on the beach and had to climb the dreaded "sand ladder", which is basically a vertical climb up a, yes, sand ladder. I think I ended up running a 7:10 pace when all said and done. Anyways, I hung on to win the Collegiate division by 3-4 minutes. Now comes a pretty significant 4 weeks out of my year. I have 4 Olympic distance races (well, 3 after last week) in 4 weeks. All of them are pretty big races. 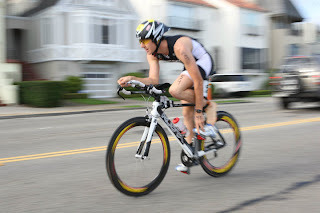 Last week I raced the San Diego Classic at Liberty Station in Point Loma. I feel like I had a big advantage on the bike course, because it goes through my standard training rout to the point and back. The race went alright. I raced in the Pro division (with Chris McCormack) and again fell off the lead pack on the swim near the last 800 meters. Luckily, I only came out 50 seconds behind the leaders. I had great bike ride, considering I repetitively pulled an "Andy Schleck" and my chain came off on three seperate occasions while downshifing into the small ring. I lost a good amount of time getting off and fixing the problem. Still managed to have a decent ride though. I had, and I quote, the WORST 10k run of my life. I don't know what I was doing. It was disgraceful. Luckily, I've asked my good friend Mike Clinch (a great runner(/triathlete) himself), to help coach my running. As of right now, I'm trying to find my leg speed again. I have the AG National Championship in Tuscaloosa, Alabama this Saturday, so we'll see how this race goes.. There are a lot of really good guys racing this weekend, so I'll have to bring my "A game" to be competitive. I'm feeling really motivated to do well. My parents and grandparents are helping me out quite a bit to get over there and race, so I have a lot of drive. It'll also be fun to watch the Elite race right after mine. A lot of the best Pros in the world will be competing for quite a bit of cash, so that'll be fun to watch. This will be a fun experience and I'm excited about it. I have no doubt in my mind that these 4 Olympic distance races will get my running legs up to decent speed before the Ironman 70.3 World Championship in Clearwater this November. Started swimming @ 21, bought my 1st bike & borrowed my Dad's running shoes @ 22.. & the rest has been fairly well documented in this blog.